Early 1990’s hip-hop was all about boasting. It was simpler time, where the content of most raps was focused on how well you could spit. A great example from this time period is “Chief Rocka” by Lords of The Underground. The song is a staple at hip-hop parties and get togethers because of it’s funky and scratch-filled beat. It encapsulates a time and sound in hip-hop that is both long gone, and fondly remembered. The song is about how great the Chief Rocka, or the head honcho of the group, and how he’s the best rhyme spitter. Both rappers on the song, Mr. Funkee and DoItAll, refer to themselves as the Chief Rocka, and, through their extensive verses, go on to explain why in great detail. As mentioned before, the beat is funky and jazz infused due to its featured samples of John Coltrane. The scratches and breakdown on the chorus are performed by Lord Jazz, who cuts the record and creates an instantly recognizable chorus. 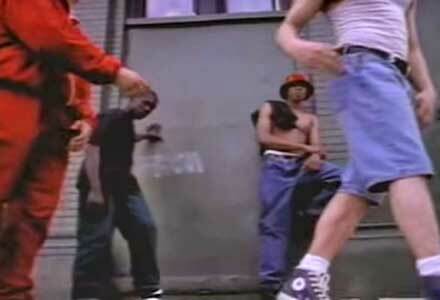 Chucks around some cardboard, a typical scene in early hip-hop. 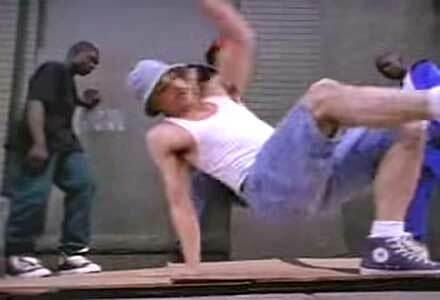 The music video features your typical scene of New York in the early 1990’s. There are breakers breakin’, and rappers rapping. There’s a whole group of breakers wearing Chuck Taylors while they dance. One is wearing a gray pair of lows, and the other two are wearing black and white highs. Other than their awesome moves, the video doesn’t feature much else. It’s the standard style of music video from early 90’s hip-hop where the artists is just rapping in some New York back alley with his whole crew behind him nodding their heads, intercut with shots of them smacking at the camera and shots of the breakdancers doing their thing. The song is a hip-hop staple and known by all, but the music video is surprisingly generic. Get yourself a pair of chucks to strike a pose in by clicking on the links below.